This is Tolkiens earliest professional publication. It is a vocabulary that was used as a supplement to Fourteenth Century Verse and Prose by Sisam. Originally published by The Clarendon Press on the 11st of May in 1922. There were 2000 copies printed of which only some were bound seperately and most of them together with Fourteenth Century Verse & Prose (by Kenneth Sisam). 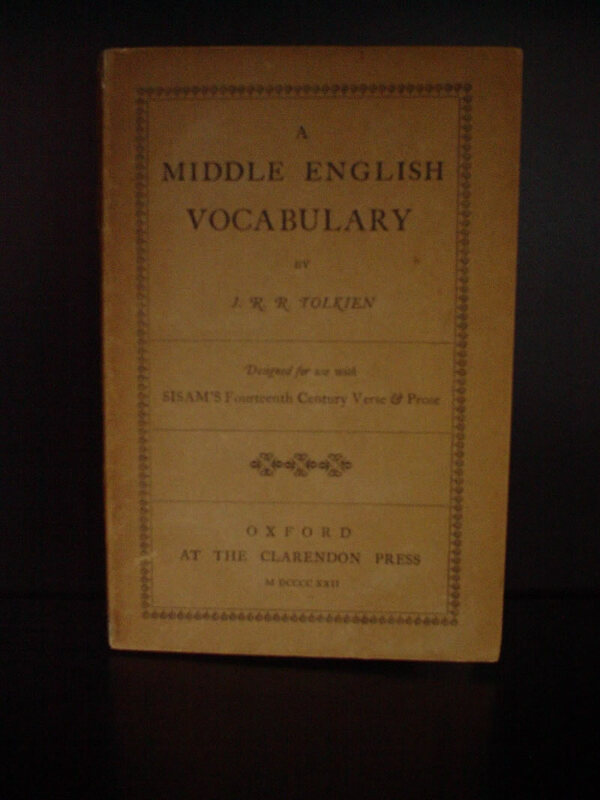 Copies of A Middle English Vocabulary on it’s own have been seen dated 1922, 1925, 1929, 1933, 1939 and 1947. The copies can vary in appearance and text; there are probably 6 different states. Fourteenth Century Verse & Prose, Sisam's collection, was a groundbreaker in its day, anything but interchangeable with others. As originally published in 1921 (Oxford, at the Clarendon Press), the 300-page "Fourteenth Century Verse and Prose" had an excellent introduction, interesting texts with informative headnotes, detailed technical endnotes, and an appendix on "The English Language in the Fourteenth Century." However, it lacked a glossary. This appeared separately the following year, as "A Middle English Vocabulary," about 170 double-column pages (no numbering), compiled by one of Sisam's colleagues, none other than the young J.R.R. Tolkien. Tolkien's contribution is a model of rigor, precision, and compression, and will probably be enjoyed by those intrigued by his created languages, and used with respect, if not affection, by others. This division in two volumes may have been a little annoying and expensive (two purchases instead of one), but it did have the advantage that the glossary could be kept open - no constant flipping to the back of the book. It was custom at the time to keep sheets until there was demand for binding. There for several variants are in existence. Margaret L. Lee praises Tolkien in a review of the book, especially for his way of working, to deal in detail with such words which form “the backbone” for the language. It prefers itself it here for example, comprehensively with the different meanings of the preposition ton to employ the different forms of the Pronomens he or the verb habben as extensive assumptions over the Etymologie of rare or unclear words to employ. After Tolkiens opinion is more important it for the study of a language to know such exactly apparently “simple” words when words hardly needed a broad, superficial vocabulary on to accumulate. The book, in its original form (not bound together with Sisam's Fourteenth Century Verse & Prose), is now quite scarce. One can find used out-of-print and rare editions in various places online: try AbeBooks.com. It is also conveniently available as part of the collection entitled The Tolkien Reader, which contains the complete books The Adventures of Tom Bombadil, Tree and Leaf (including Tolkien's essay "On Fairy Stories" and his autobiographical fiction "Leaf by Niggle"), and Farmer Giles of Ham, as well as a short dramatic piece by Tolkien, "The Homecoming of Beorhtnoth Beorhthelm's Son," which is based on the classic The Battle of Malden, and also adds as the introduction Peter Beagle's essay "Tolkien's Magic Ring." * Margaret L. Lee: Middle English. In: The Year's Work in English Studies. Volume. II/1920-1 Oxford University press, P. 42-3.